CougSat-1, a 4-inch-cube satellite, is designed to broadcast the phrase ‘Go Cougs!’ from Earth’s orbit and signal club members when it is overhead. When seniors in WSU’s Cougs in Space club graduate in May, they hope a WSU satellite that they built will be looking down on them. Club members have been building a four‑inch cube satellite for the past two years as part of NASA’s CubeSat Initiative. Supported though a NASA grant, the program provides students with the chance to organize, budget, design and build a satellite that NASA will launch into outer space. 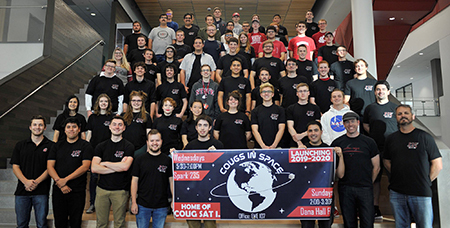 The students hope their satellite, named CougSat‑1, will regularly broadcast the phrase ‘Go Cougs!’ from Earth’s orbit and will signal club members when it is overhead. The students also are working to incorporate an experiment that will explore how tomato seeds germinate in space. More important than what the satellite does, however, is the experience that the students get in building it. Club members divided themselves into disciplinary systems teams and are developing the satellite’s structure, thermal properties, power source, systems and orientation. “In the real world it takes people with different specialties and background knowledge to create something as complex as a satellite,” said Eversole. Cougs in Space involves more than 50 students from various majors divided into disciplinary teams that are developing the satellite’s structure, thermal properties, power source, systems and orientation. Eversole says that having all the teams work together is challenging but rewarding. The club members also work with other clubs and departments across campus, which provide diverse viewpoints and high-quality solutions to problems. For example, the club is partnering with WSU’s Amateur Radio Club on developing a communications system for the satellite. The project allows the students to gain skills while they’re building something that WSU can use for research. Working together is helping them become better engineers, leaders and teammates, as well as opening up internships and job opportunities that can be life changing. The students also have had valuable opportunities to network with alumni, including past club members. Michelle Danese, a mechanical engineering student and Cougs In Space’s chief operations officer, worked with several companies as the team designed the satellite frame for manufacturing. “When I start my career in manufacturing, I can use the lessons I learned from Cougs in Space,” said Danese, who recently obtained an internship with an engineering firm, Umbragroup. 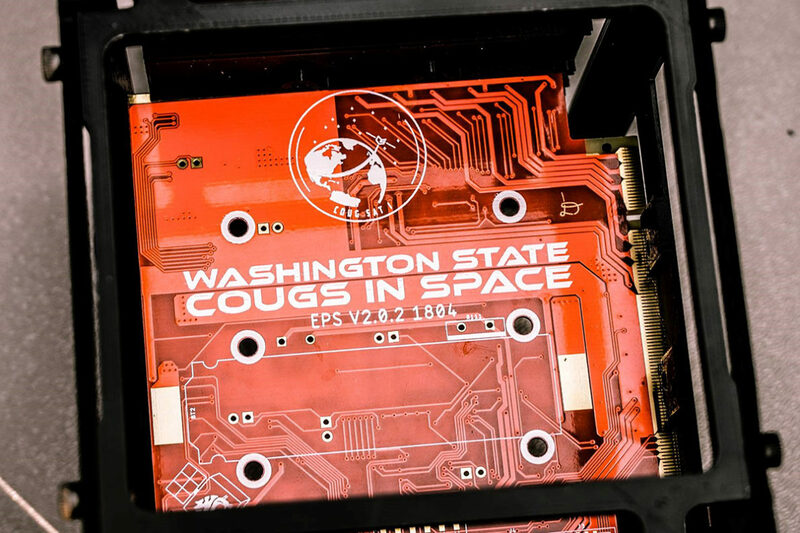 WSU’s Cougs in Space club meets 5:30 p.m. Wednesdays in Spark 235. The club is hosting Cougs in Space Days, Oct. 17‑18, for students interested in pursuing careers in the space industry.